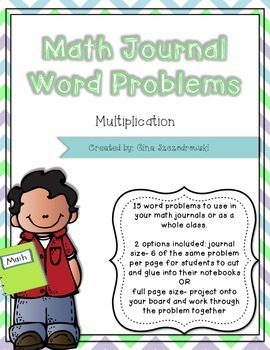 Included in this file are 15 different multiplication word problems. 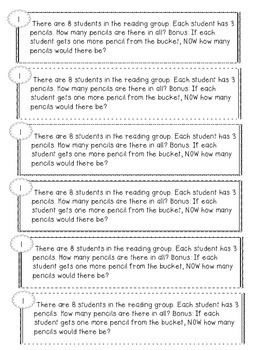 All problems have either a bonus question (extending on the original question and preparing students for 2 part/2 question problems OR an explain your thinking question. Each word problem comes in two formats. The first format is 6 copies of the same word problem on a page. This is intended to be use in math notebooks/journals. The second format is one problem on a page with work space and space to solve the bonus problem. This can be projected on the board and completed/checked as a class or can be copied and put into a workstation with dry erase sleeves/sheet protectors. To see an example, download the preview where you will get 2 free pages (one question in both formats mentioned above). This product was made for my third grade class but I can see it being used in 2nd grade as well and in 4th grade for intervention. Thanks for taking the time to look at this resource!